An Academy Award winner and Milwaukee native visited with Rufus King students Thursday with advice on how to achieve success. John Ridley won an Oscar for best screenplay during the 85th Academy Awards for the film, 12 Years a Slave. It's one of his maybe the highest of his accolades, depending how much you loved Martin or The Fresh Prince of Bel-Air; which he was a writer for. However, he's happier to be inside Rufus King, across the street from his childhood home where he can share his knowledge and experience with the next generation. "I encourage everybody, get involved," Ridley said. "These are our kids." Ridley joined a Rufus King class focused on writing. The class, Our Writing Blocks, brings nearly 30 students together to help avid writers and readers see where their skills can take them. "This goes far beyond anything you can read in a textbook when you can actually talk to someone who is making history," Tom Haslett, one of the teachers said. "I don't think it's any different than if you meet an athlete, football player, basketball player. I'm happy they got to see someone who has excelled and came out of the world of academia, so to speak." Ridley's speech was very casual and direct to the group of teenagers. He spoke in a way your first college professor typically addresses a class. It's more of a conversation on equal ground than teacher to student. It just felt more adult. It's how Ridley views this next generation, not as children but rather as those who are coming to fill his shoes. "If there was one John Ridley who could come out of here, there's a Jane Ridley," Ridley said. "There's someone else. They have a story to tell. They have a desire to tell it. I'm not the only person from Milwaukee who has made it out to tell the stories." This was more than a career day speaker talking to a class. The back and forth between the students and Ridley was extremely inquisitive. Students asked tough questions about how to deal with rejection, how to develop confidence in something so personal and where Ridley continues to draw inspiration from. While it was only about an hour, it was a heart felt conversation from someone the students could see themselves becoming. After all, Ridley's childhood home is right across the street from Rufus King. "It gives an understanding to us here that's a real possibility for us to achieve and nothing is out of our lane," Favour Kerobo, a senior at Rufus King said. "The sky is the limit." 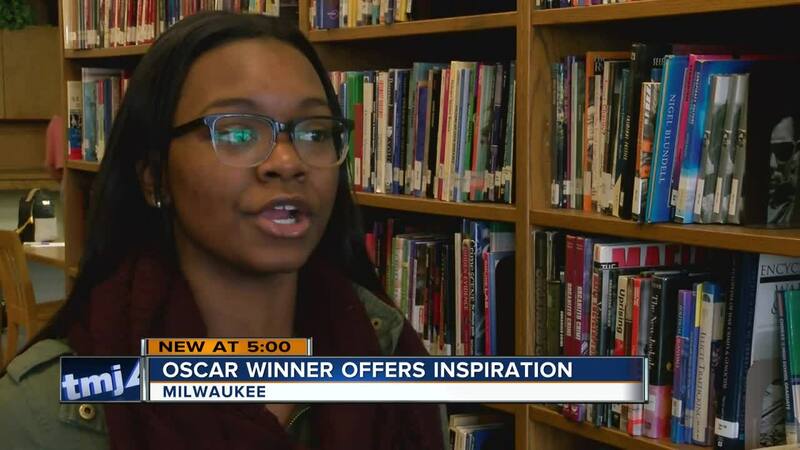 "Being from City of Milwaukee, growing up here, it's great to see somebody from here who not only got to follow their dreams, but also being successful at it," Amira Adams, a senior at Rufus King said. "We face adversity on a daily basis. Being able to overcome that and overcome that to a place where he can put out stories and put out messages to inspire and encourage and send knowledge to people so they can learn and grow from that was amazing." The inspiration is mutual for Ridley. He opened Nō Studios in October as a collaborative space for creatives to come together. It is a relatively cheap option for people to host a screening of a film, a stage to perform or a number of other artistic ventures. However, it would be difficult for 17 and 18 year old high school students to afford such a space. But these kids from Rufus King are able to use the space for free and get a master class of sorts from people who are doing what they want to do right now. "There is a lot of talent in this city," Adams said. "We just have to be able to market ourselves and really put ourselves out there and not be afraid to take that next step." That next step is made a bit easier thanks to a grown man who was once just a kid from Milwaukee. "I mean this sincerely, if I can do this, anybody can," Ridley said. "The big thing is, it's not those folks who made it out but who are those folks who came back. Whether it's Milwaukee, Cleveland, St. Louis, it doesn't matter where. Who are the people willing to come back? Because this is the next generation."